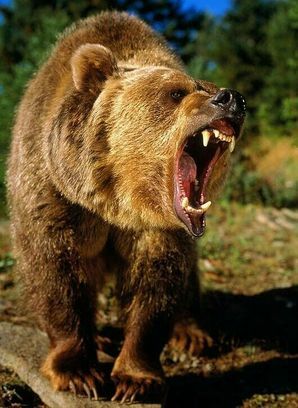 The Rootbear (Ursus Orsus Radix) is a bear boss-monster, and the origin of all things unbearable in Godville. It's the wildest bear in Godville, but feeds on the sweet sap of the Sassafras tree, a source of Sarsaparilla or Rootbeer, a non-alcoholic pagan beer feared by many heroes and tavern owners. Rootbears in turn feed on this fear by eating the many heroes and tavern owners but are mostly found in cellars and beer-ridden locations underground. The Rootbear presented itself to be the wildest animal known in Godville with little regard for logic or fashion. Trouble was brewing in the Taverns. There was a rapid and steady decline of heroes, especially when going down the stairs. The gods had introduced a form of non-alcoholic beer known as Rootbeer. Godvillian Rootbeer mimicked beer with the downside of making the drinker stay sober. The adventurers of Godville had never known responsibility for their actions, let alone deal with their consequences. The Rootbeer was unbearably hated, sometimes feared and framed as a false beer designed to mislead heroes from misleading themselves. Heroes and heroines of Godville revolted against their own gods. Tavern owners sponsored the fights in favor of the Beer economy, though it did more harm than good to the heroes and heroines. Just as the War Between God and Herokind began, it ended, because the heroes frankly didn't stand a chance or rather didn't stand at all. Most of it was just a group of heroes hitting themselves on the head anyway. Like every other time they had defied their god and goddesses, it was never a fully conscious decision. As punishment, the gods tried negative enforcement, a technique similar to training pets and voluntary lab animals. 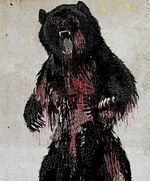 The Rootbear was created as an embodiment of Herokind's failure to bear responsibility for its own consciousness and exercise self-control, a physical reminder to the heroes and heroines of Godville, a monster that was fear itself and fed on the greatest fear of most Godvillian heroes and heroines. A monster, because it was not just wild, it was sober. Its close cousin, the Brown Bear in comparison is quite tame and is known to have a good command of British-brand English with huge success in city life, regularly securing roles in popular films, children books and singing. A Rootbear can be found when activating an Activatable Artifacts or executing the Dig Godvoice command. It has a HP 1.5x the hero or party and is recommended to be fought with an ally in a Multi-Boss Battle via a Dig Artifact. You should possess an accumulator charge in case your ally's God or Goddess is inactive. Rootbears like to laze around for 10mins during battle, depending on its Boss-monster ability. Taking one down rewards you with large sums of gold and 2-3 Bold Artifacts presumably stored by the Rootbear because winter is coming. Below is an excerpt from a record of a Rootbear battle. 06:42 The heroes defeated the nasty creature! █████ got 4955 gold coins, a figure of speech, an inner voice amplifier, a sarcasm intensifier and a wit sharpener. █████ got 5022 gold coins, a fillet of the Rootbear, a golden brick, a metaphor mixer, a book of dungeon etiquette and a ticket for 'Godville the Musical'. **Disclaimer: This Aura of Censorship is not sponsored by official employees of the Godville Game and is the author's implementation of the Rules. If you gain any Auras or Aura inducing symptoms, please consult your Guild doctors for future use. This is a list of known Bear subspecies that originate from the Rootbear but have evolved over time from mutations and curses. Ursus Biadfectus - Bipolar Bear Originated from a Tradeburg incident and is known to migrate back and forth towards nowhere in particular in tundra plains. The cursed Herowinian coin artifact referenced is thought to be the Three-headed coin that matches the Herowin coat of arms. This page was last edited on 23 February 2019, at 12:33.